Explanation: The Milky Way is massively bright on this cold, clear, altiplano night. At 4,500 meters its reflection in a river, a volcanic peak on the distant horizon, is captured in this stitched panorama under naturally dark skies of the northern Chilean highlands near San Pedro de Atacama. Along the Solar System's ecliptic plane, the band of Zodiacal light also stands out, extending above the Milky Way toward the upper left. In the scene from late April, brilliant Mars, Saturn, and Antares form a bright celestial triangle where ecliptic meets the center of the Milky Way. Left of the triangle, the large purple-red emission nebula Sharpless 2-27, more than twenty Moon diameters wide is centered around star Zeta Ophiuchi. This photo seems to show that our galaxy is non symmetrical similar to other galaxies that have had gravitational interaction with each other (eg., Arp 286 trio). Ah, the Pipe Nebula... which can also appear... at least to me... as a child in a wagon, with the pipe stem as the handle... and above that...is BIRD MAN!!!!!! Flying high, up into intergalactic space!!!! stephen wiggins wrote: This photo seems to show that our galaxy is non symmetrical similar to other galaxies that have had gravitational interaction with each other (eg., Arp 286 trio). Our galaxy may well be as symmetric as a great many other spiral galaxies. It's very difficult to tell from the inside, since we only see a fraction of it. And what we see is shadowed in places by dust clouds, which enhance the illusion of asymmetry. And then, there's the apparent curvature introduced by the camera lens and projection onto a plane. I wouldn't try to infer much about the actual shape of our galaxy from an image like this. <<According to a new study by a team of international astronomers, the Milky Way's galactic disk resembles the undulating ripples seen after a pebble is tossed into a pond. In other words, it's not flat -- it's corrugated, like a steel roof. The study, led by Heidi Jo Newberg, an astronomer at the Rensselaer Polytechnic Institute, in Troy, N.Y., is a reinterpretation of data collected as part of the Sloan Digital Sky Survey. The 2012 survey helped astronomers locate a ring of stars, existing just off the plane of the Milk Way's disk. "In essence, what we found is that the disk of the Milky Way isn't just a disk of stars in a flat plane -- it's corrugated," Newberg explained in a press release. "As it radiates outward from the sun, we see at least four ripples in the disk of the Milky Way. While we can only look at part of the galaxy with this data, we assume that this pattern is going to be found throughout the disk." I am sure there's also some distortion in the image due to the lens / setting on the camera. http://www.upi.com/Science_News/2015/03/11/Milky-Way-isnt-a-flat-disk-its-corrugated/6131426095739/ wrote: . . . "As it radiates outward from the sun, we see at least four ripples in the disk of the Milky Way. . . ."
Is that a typo "... radiates outward from the sun"? I would think they could have meant that, but then only actually because the pattern radiates outward from the galactic center, right? I am thinking of a notion that I picked up from Ann (though she may not ascribe to it herself), that some spiral galaxies were scribed out by a rotating bar that was slowly losing its ends (that material becomes the arms of the spiral), and hence shrinking with time. This would create spiral arms. If the bar is rotating in the plane in which it lies, it would create a flat spiral shape. But if the bar is tilted with respect to the plane of rotation, then this would create a corrugated pattern as described in that article. we see at least four ripples in the disk of the Milky Way. . . ."
Based upon the diagram, they haven't (or can't) do any measurements in the general direction of the galactic center ... so who is to say. What an amazing sight . Even allowing for exposure time enhancement of detail I'm sure that the scene would still have been beautiful to see. I wonder how long such dark enough skies sites will be around, as ever increasing light pollution will sadly make them a thing of the past. From where I live it's a good night if I can readily see more than just a few of the brighter stars even on clear sky nights . DavidLeodis wrote: What an amazing sight :). Even allowing for exposure time enhancement of detail I'm sure that the scene would still have been beautiful to see. I wonder how long such dark enough skies sites will be around, as ever increasing light pollution will sadly make them a thing of the past. From where I live it's a good night if I can readily see more than just a few of the brighter stars even on clear sky nights :( . The good news is that there's lots of dark around, and most people can easily get to it. The Milky Way looks the same from where I live, in the middle of Colorado and not more than a couple of hours from major urban centers. The Milky Way looks the same from where I live, in the middle of Colorado and not more than a couple of hours from major urban centers. Chris Peterson wrote: The Milky Way looks the same from where I live, in the middle of Colorado and not more than a couple of hours from major urban centers. and not more than a couple of hours from major urban centers. First hand one could probably make out the Milky Way here in Washington,D.C.. 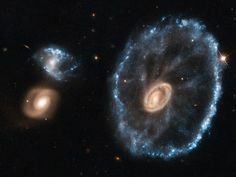 The Cartwheel galaxy and its neighbours. Fascinating, Art. The ripples in the Milky Way's disk suggests to me that the disk is undulating, like the surface of pond, when a pebble has been thrown into it. The Cartwheel galaxy is the poster child example of a spiral galaxy that has been transformed into a ring galaxy by being hit by something really major, likely a smaller galaxy that has plunged right through the Cartwheel's center. 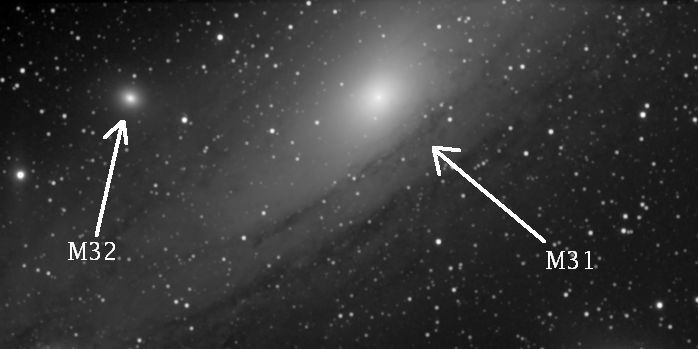 Fascinatingly, the Andromeda galaxy also appears to be a ring galaxy rather than a classic spiral galaxy, and the culprit that has transformed it is almost certainly its small satellite galaxy, M32, which has probably passed right through the disk of M31 on at least one occasion. The Milky Way is, by all accounts, not a ring galaxy but a spiral galaxy. It hasn't undergone anything like the major upheavals of the Cartwheel galaxy or the Andromeda galaxy. Yet it may well be that our galaxy has nevertheless been hit by something sufficiently substantial to make its disk undulate. Infrared Milky Way. Photo: Coolcosmos/IPAC/Caltech. But an image like this one certainly suggests that the Milky Way is pretty flat. Not that I know if the image was trying to show any curvature of the Milky Way. I think most are in favor of cutbacks in D.C. Even on the high plateau.